This recipe is simple and uncomplicated. It requires very little prep work and can be done in less than an hour if you get cracking. There is no water bath, headspace, processing, or jar sealing to worry about. It’s just honey and nuts! I’ve been meaning to try this recipe from the River Cottage Handbook No. 2 for a while and there is no better time than the present, when I can still get my hands on some nuts. Here, in Northern Ontario an assortment of chestnuts, hazelnuts, pecans, and walnuts are available in bulk and then all of a sudden they’re gone. Why and where they go to I’m not really sure? Crack all of the nuts and discard the shells. Thoroughly wash and sterilize 2 x 125mL jars or 1 x250mL jar. We sterilize our jars in the oven at 250F for 30 minutes. Heat frying pan on low heat and add shelled nuts. Toast the nuts on low heat for 5-10 minutes making sure they do not burn. 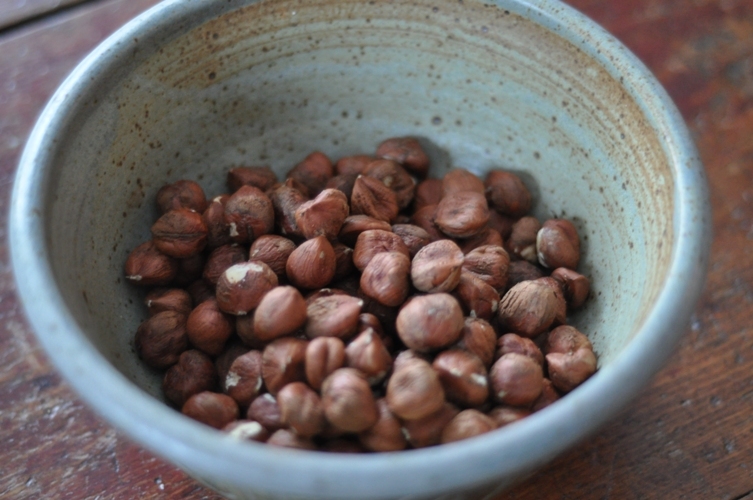 This process will remove some of the outer skin; however, the bulk of the nuts maintained their thin outer skin. It may have something to do with the freshness but I’m not sure. If you want to remove all of the outer skin (by that I mean the brown paper-thin covering ~ you could try rubbing the toasted nuts against a metal sieve) I’m not too worried…it is what it is. Remove from the heat and allow them to cool. Pack the nuts into sterilized jar (Note: allow the jars to cool to room temperature before packing). Alternate the nuts and honey, filling the jars in layers. About 3-4 layers of nuts to 1 tbsp of honey. Don’t worry too much about getting this exact…just be sure that the nuts are well covered in honey and that the jars are full and packed tightly…or, you’ll get floating nuts in honey. Seal securely with lid, label and store in a cool dark place for up to 12 months. These honeyed hazelnuts will brighten up your plain yogurt or be great on porridge but think about using them in some of your baking too! We also have a bag of chestnuts and wonder what they’d be like preserved in some chestnut honey? If the jam I plan to make doesn’t use up the entire bag of chestnut then I’ll give it a try. Oh my gosh, this looks heavenly. I love hazelnuts and honey!! 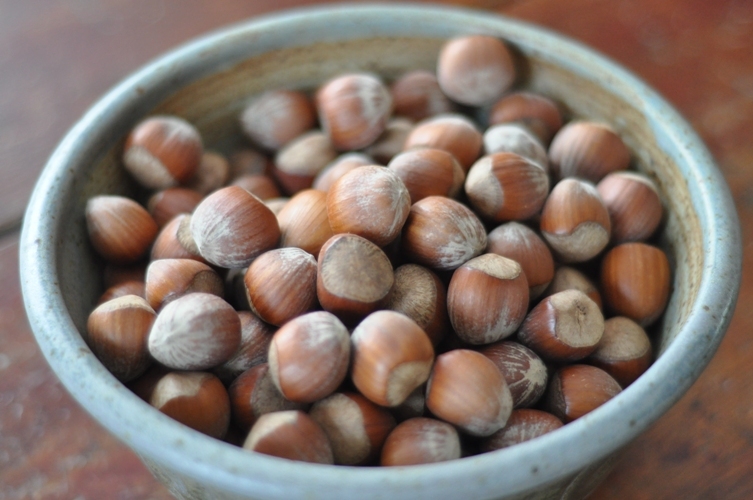 Rolling the toasted hazelnuts in a towel will remove the majority of the skin with out damaging the nuts. I’m going to give this a go with the pecans that we gathered from our son’s trees. 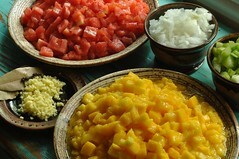 What a great topping for pancakes, waffles and desserts! I’m kinda thinking it might be a nice glaze on some meats too! Great idea and thanks for the tip! that looks delicious and wonderful, and your photos are gorgeous. 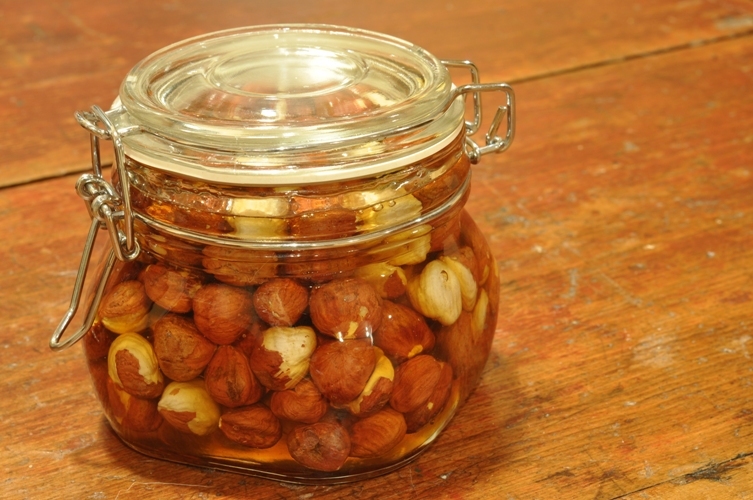 so if you preserve hazelnuts like this, how long will this keep for? is it about the same as a waterbath canned good (which I try to use within a year) ? Beautiful! What a lovely idea. Nothing like sitting around the fire cracking nuts. And then putting them in honey. Yum. We named this our Condiment of the Web this week. Awesome recipe!